The Guitar Column: ANSIR Custom Guitars and Basses -- Angling It The Way You Want It! ANSIR Custom Guitars and Basses -- Angling It The Way You Want It! Although instrument makers like Klein, and even Ovation (remember the Breadwinner solidbody?) have explored building in the 'ideal' neck playing angle into their instruments, ANSIR are furthering the concept of the ultimate ergonomic instrument by a giant leap. 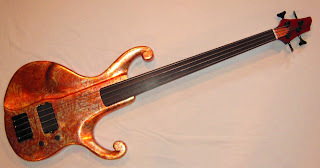 ANSIR -- short for Angled Neck String Instrument Resource -- uses a proprietary system to measure a player's particular playing position and ideal neck playing angle. 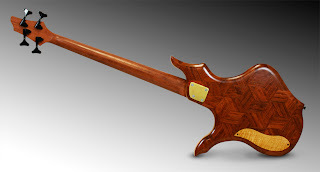 The end result is a one-of-a-kind, custom-made instrument that can be played very comfortably without strain or fatigue. Interestingly ANSIR guitars and basses are only offered as bolt-ons. But if the customer craves a heel-less neck-thru design, a build technique is incorporated where the neck is first glued into the neck pocket and then bolted. The entire joint is then covered in a molding compound which is then smoothed over. This is really a novel concept, and I wouldn't be surprised if other manufacturers start licensing this technique. Another unique feature is the inlaying of hand-cut squares of wood into the bodies that, according to ANSIR, dramatically improve the tone of their instruments. Speaking of tone, ANSIR offers only passive electronics as a standard feature. The company's philosophy is that any active equalization and tone-shaping should take place after the instrument, so that the true tone is kept pure. Top off your custom-build with a variety of exotic tonewoods like padauk, bubinga, purpleheart, bloodwood, koa, wenge, pau ferro, goncalo and zebrawood and you truly have a custom custom instrument.